"An absolute riot: hilarious, brilliant, and outright indispensable for both drivers and their unwitting passengers. Highly recommended!" The Columbia Review. “The Little Handbook for Navigationally Challenged Cidiots” by G. Head (Author), D.C. Head (Contributor), Ken Head (Contributor), and S.V. Head (Contributor) is a supremely funny book of remarkably clever observations on today’s driving habits. In fact, we found the quiz by itself to provide enough laughter, insights (and shame) to make it worth buying the whole book. What distinguish “The Little Handbook for Navigationally Challenged Cidiots” is its uncanny observations of odd, obnoxious, selfish, and outright stupid behavior every driver and passenger witnesses every time they venture onto the roadways. Not one section could be read without recognizing a familiar and memorable ‘cidiotic’ moment that could have ended with clashing metal and agonized screams, or at the very least, a juicy expletive. We especially enjoyed the authors’ marvelous ability to attach titles to the cidiots by their particular habits, such as “The Inner-Laners” (going straight from the left-turn-only lane), or “The Arrogant Knights” (dropping off passengers while blocking all three lanes of traffic), just to give you a taste. 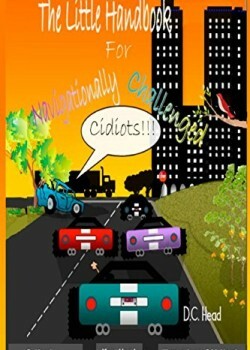 In summary, “The Little Handbook for Navigationally Challenged Cidiots” is an absolute riot: hilarious, brilliant, and outright indispensable for both drivers and their unwitting passengers, as well as for surviving pedestrians and public-transportation loyalists who mistakenly believe that their mode of travel is safer. In fact, any reader who has ever been in a moving vehicle (or plans to risk it in the future) would laugh out loud, keep turning the pages, and quote sections to family and friends. Highly recommended!